T4A 2015 God-Connections! ONLY GOD!! It has been a while since I stopped long enough to share specifics surrounding His never-ending, awe-inspiring…God-connections. They always take me by surprise and I cannot help but smile and shake my head in disbelief. This year’s Together for Adoption conference certainly was full of them. They started during the Thursday afternoon pre-conference. The presenter had us each introduce ourselves and state why we were there. There were about 25 of us in attendance. At the break, one of the other attendees came over to confirm what I had said. His wife teaches at the Florida school for the Deaf in St. Augustine. I told him I have multiple Deaf family members living in St. Augustine. We shared contact information for whatever God might have in store for us in the future. Exhibit booths were open during registration after the pre-conference. Charles and I dutifully placed ourselves at ours. Originally, the Signs for Hope booth had been assigned to a rather obscure place. When I saw the map of the vendors and their placements, my first thought was, “No one will even know we are there.” Almost immediately, His Spirit reminded me of the many God-connections He makes even when I do not have a booth at orphan care events. He’s got this! Two days before the conference I received notification our booth had been moved to a new spot, since one of the vendors had pulled out. When I saw the new placement, in the auditorium at the back next to an entrance, I was humbled. Within a few moments I greeted one of the volunteers standing at the entrance. He said he had already noticed our booth and told me his daughter was in Deaf Education in Durham, NC. A few moments later, another volunteer came closer and began to talk about whether or not she would adopt again. She was afraid she was getting too old. Of her multiple adoptions one daughter was deaf and another son Hard-of-Hearing. 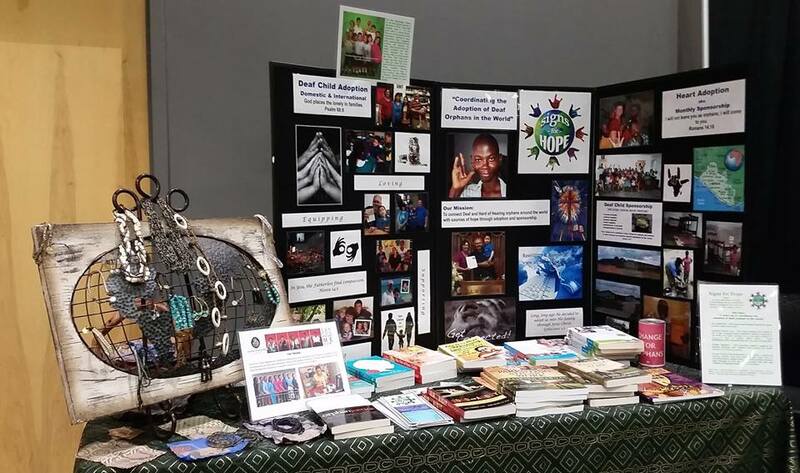 The exhibitor manning the Bair Foundation booth next to us was fascinated by what God has called us to and wanted to know if she could connect her brother who is working with orphans in Ethiopia to us? Yes, of course! Following the general session, multiple folks stopped by the SFH booth and again on Friday and Saturday morning. One couple was thrilled to see us and took a business card so they could connect her sister and brother-in-law in Greenville, SC to us since they are in the process of adopting a deaf child. I shared our T4A trip on my FB page on Wednesday and was contacted by a young lady, living in Durham, who had been connected to me by a dear friend a few months ago. Was there a time we could meet while I was in town? Of course. We spent about an hour and a half together during the dinner break Friday night. It will be exciting to see how God continues this connection. One of these days, I will have to start keeping up with these, as they happen, so we can all know the exact count. Suffice it to say, the percentage of folks who had deafness connections was very disproportionate to the number of attendees…which was about three hundred. We found out on Saturday, just after the conference ended, a third T4A presenter, I knew of two previously, was a dad of multiple adopted Deaf children. It is always fascinating to see where God has placed precious Deaf children. « Don’t Be Fooled…Pure Religion is Far More Than Just Adoption!